Create, remove, manage multi RAM disks. Is there a better alternative to RAM Disk Utility Pro? Is RAM Disk Utility Pro really the best app in System category? Will RAM Disk Utility Pro work good on macOS 10.13.4? RAM Disk Utility Pro can help you create, remove, manage and monitor multi RAM disks. 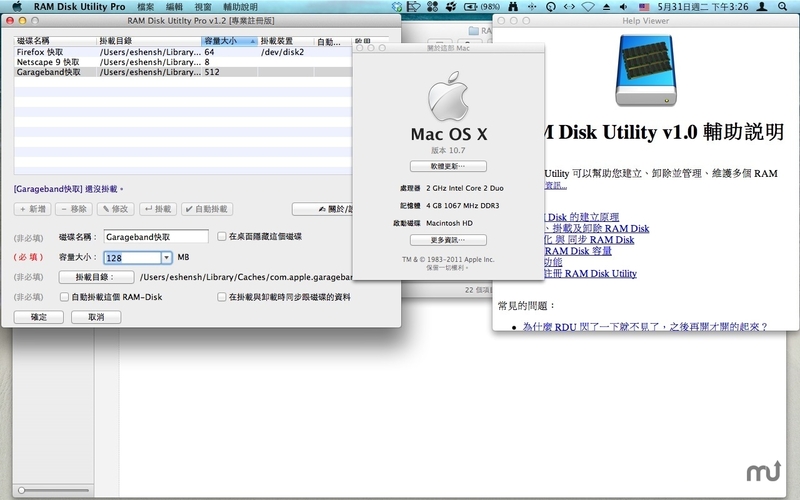 you can specific size, name, mount directory of RAM Disk. Smart Application cache directory detect, easy speed up. You can save many RAM Disk Settings. Auto-Mount RAM-Disk Function in program startup. You can set program auto quit or mimimize window after an Auto-Mount action, it helps you do everything automatic. Support Sync RAM-Disks with original Directory that mount when RAM Disk is creating or removing. Monitor the free space of RAM-Disks, alert or auto-unmount when free space is not enough.